(CNN) -- Second seed Roger Federer won his first title of 2009 after stunning world number one and clay-court king Rafael Nadal in straight sets in front of his own fans in the final of the Madrid Masters on Sunday. 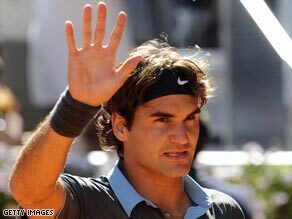 Federer acknowledges the crowd after stunning Rafael Nadal in straight sets in the Madrid Masters final. Swiss ace Federer, who had won 57 career titles but was without a tournament victory since winning on home soil in Basle last October, took the honors 6-4 6-4 in one hour and 26 minutes. The win also ended a remarkable run of success on clay for world number one Nadal, who was unable to repeat his heroics from Saturday's epic semifinal against Novak Djokovic when he fought back from the brink to win a gruelling battle 3-6 7-6 7-6 in four hours and three minutes, saving three match points along the way. That victory over Djokovic was Nadal's 33rd successive win on clay stretching back over a year, while in total the Spanish superstar had won 150 of 154 matches on dirt since 2005. However, the emotion of that success was clear to see on Sunday and the Mallorca-born 22-year-old was no match for his old foe, as Federer took the game to his opponent to beat Nadal for only the second time in 10 meetings on clay and end his long wait for another title. Nadal, despite his epic match on Saturday, was quickly into his stride as he sought a sixth title this year and he created two break points on separate Federer service games early on. The Spanish ace failed to make the most of either of those chances though, and when Federer's first opportunity came along in the ninth game of the first set he was not so profligate. Nadal had fallen 0-30 behind on his serve but looked to have dug himself out of the hole, but Federer hit back again to take the game and moments later he was celebrating the set after holding serve to love. Nadal had lost just one of 41 sets on clay this year heading into his semifinal, but he suffered a second loss against Djokovic to go 1-0 down in Saturday's match and found himself in an identical situation on Sunday. He looked in determined mood in the second set though, holding his first two service games to love, but it would prove to be Federer who was first to break in the fifth game. The Swiss ace got the chance with a superb drop shot and when Nadal then saw his forehand shot go long, Federer had the break to go 3-2 ahead. Federer kept that advantage until the 10th game, when Nadal, with no room for error and staring defeat in the face, had his big chance to get back on terms when he created two break points. However, Federer saved both of those and although he missed his first championship point, he clinched the title with his sixth ace of the match. Earlier in the women's final, world number one Dinara Safina clinched her second title of the year after overcoming Danish teen sensation Caroline Wozniacki. Top seed Safina, following on from her success in Rome last week, was simply too good for ninth seed Wozniacki and powered her way to a 6-2 6-4 win.